While he’s perhaps best known for his work as a writer-producer on The Simpsons — including being the mastermind behind “steamed hams” — Bill Oakley is also a comedy writer who has worked on Mission Hill, Portlandia, and most recently Disenchantment. Over the past year, Oakley has made a name for himself as an Instagram fast-food critic, so after last night’s news that Donald Trump welcomed a bunch of national college football champions to the White House with a giant fast-food feast, we reached out to Oakley for his thoughts on the much-ridiculed meal. The moment I saw the first photo on Twitter last night, I knew it was coming. 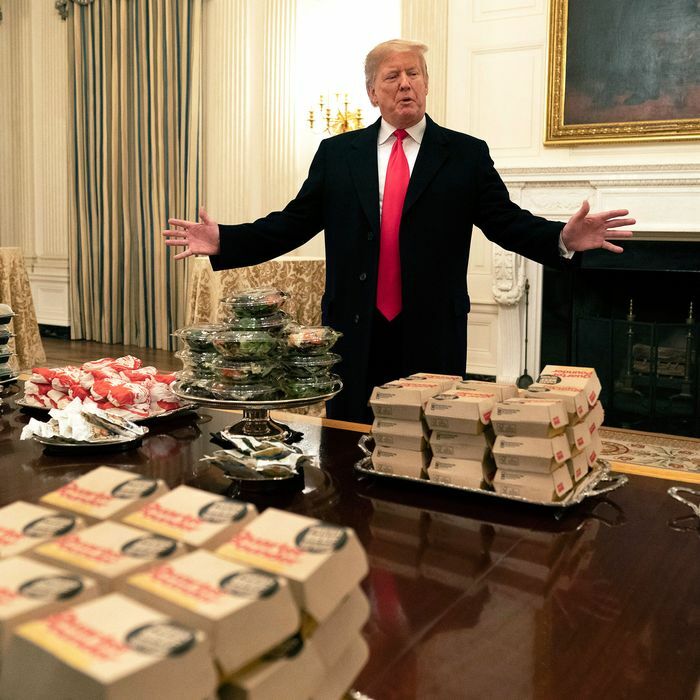 President Donald J. Trump standing with a smile before a spread of fast-food hamburgers purchased for the Clemson football team like Principal Skinner grinning as he presents a tray of “steamed hams” to an incredulous Superintendent Chalmers. And moments later the deluge began — not only of remixed Simpsons memes, but also the torrent of Trump critics bemoaning the laughable outrage of the lousiest American president surrounded by a buffet of the lousiest American food. One of the few things I do agree with Mr. Trump on is that fast food can indeed be “great American food.” And yes, I know about the health risks, labor strife, farming issues and all that, and I know a meal at Wendy’s isn’t likely to rival a meal at the French Laundry. But let me make this clear: Just because Donald Trump likes fast food does NOT mean fast food stinks. Certainly not ALL fast food. I mean, have you even been to In-N-Out, Five Guys, Shake Shack, or Popeye’s? Have you tried McDonald’s Sweet N’ Spicy Honey BBQ Glazed Tenders? Delicious, affordable, consistently innovative fast food is one of America’s great achievements. We are in the midst of a golden age of fast food. And if you are sneering derisively right now, I already told you stop reading. It was almost certainly cold. Literally EVERYONE knows that almost all fast food, especially burgers and fries, are good for about ten minutes max after they leave the restaurant. (Filet-O-Fish for three minutes at most.) It seems likely that every item on that buffet had sat far longer, without the benefit of heat lamps — except possibly on the pizzas (?!). To not acknowledge this, or attempt to remedy it somehow, is senseless. According to the Washington Post, the president spent approximately $3,000 of his own money on the buffet. A self-proclaimed billionaire only spent $3,000 on an event to feed 130 guests. Do the math. The man literally OWNS A HOTEL five blocks away from the White House — a hotel that is perfectly capable, I’m sure, of catering an event for a visiting football team. There is no way this event wasn’t going to look embarrassingly cheap — like a desperate emergency meal of last resort — and fast food deserves better than that, even Burger King. There is no way to know whether the president himself selected the restaurants, or whether he just barked “Get some cheap fast food!” at a terrified minion. Nonetheless, McDonald’s, Wendy’s, Burger King, and Domino’s — although perfectly fine and in some instances, great — are the fast-food selections of someone who has not been out in public since the 1980s. There are not one but TWO Five Guys within walking distance of the White House. There is also a Chipotle, a Qdoba, and a Baja Fresh — though perhaps the president frowns on ethnic food from that country that still won’t pay for the wall he said they were going to pay for. And there is also a Subway, but anyone can be forgiven for overlooking that, I guess. Yes, the president has palate of a 6-year-old child. So do I, I suppose. But on the upside, so does Warren Buffett, the world’s third richest man and owner of Dairy Queen. As is the case with many things he professes to love, the president’s alleged passion for fast food seems zestless and inauthentic. When asked by a reporter last night which was his favorite item on the menu, Mr. Trump replied, “I like it all. I like it all. It’s all good stuff, great American food.” Then when pressed by Yahoo News on whether he prefers McDonald’s or Wendy’s, he equivocated, “If it’s American, I like it. It’s all American stuff.” Oh, come on. Maybe he was trying to avoid offending Burger King by taking sides, but when has this president ever tried to avoid offending anyone? More likely, he just didn’t know or care. (He has been known to mistakenly call the Filet-O-Fish the “Fish Delight.” Okay, yes, he’s a busy man and has better things to do than correctly recall the names of things, but this is a sandwich he eats regularly, sometimes two at a time!) Though he may profess to love fast food, he has also said “I love country music,” and my guess is he’d be hard-pressed to name a single country song. Thus, I say there is nothing inherently wrong with a fast-food buffet, even at the White House. A well-curated, hot (recently cooked), enthusiastically offered selection of burgers, fried chicken, French fries — even the brand-new vegetarian simulated-meat Beyond Burger from Carl’s Jr. — would be well-received by this author and many others who are not predisposed to dismiss the entire world of fast food with a holier-than-thou sniff. I ask you to separate the meal from the man. I ask you to rediscover the simple pleasures. And, perhaps most importantly, I ask you to check out my fast-food reviews on Instagram, because I am utterly shameless. Thank you.